Heat broth in a saucepan and keep warm. In a large, heavy-bottomed pot or Dutch oven, melt butter until foaming subsides. Add leeks and shallots and sauté until soft and just starting to brown, 5-8 minutes. Stir in garlic and rice, stirring to coat all of the rice grains. Cook for 2-3 minutes, until fragrant. Add champagne and stir until almost completely absorbed, scraping the bottom of the pan. Stir in one ladleful of hot broth. Cook, stirring constantly, until almost all of the liquid is absorbed, regulating heat to maintain a gentle, but steady bubble. Continue adding broth one ladleful at a time, gently stirring and only adding more liquid when the prior addition is nearly absorbed. 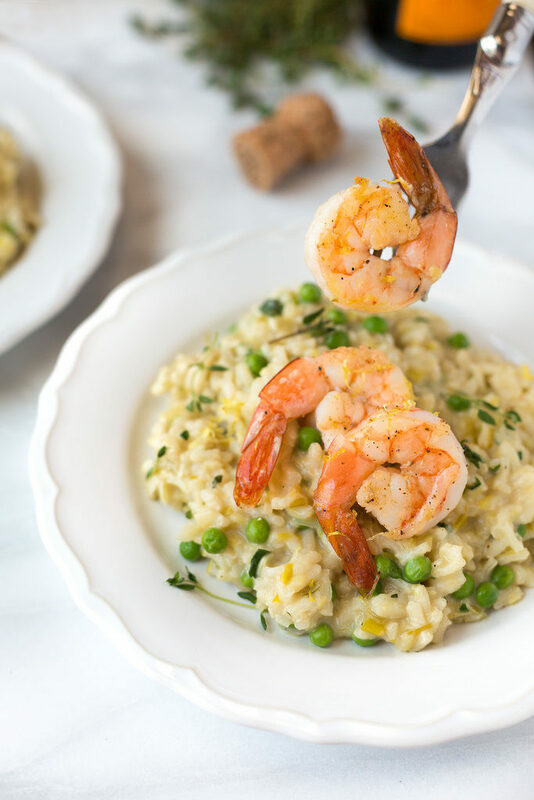 Risotto is ready when rice grains are tender, but still have a slight chew in the center, and the texture looks creamy, about 25 minutes. Remove risotto from heat and stir in peas, Parmigiano Reggiano, thyme, parsley, lemon zest, 1/2 teaspoon pepper, and kosher salt to taste (I add about 1/2 teaspoon, but this will depend on your broth/stock). 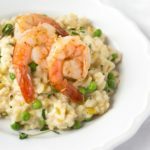 If your risotto becomes too thick after adding the cheese and peas, you can thin it out by stirring in a little extra broth. 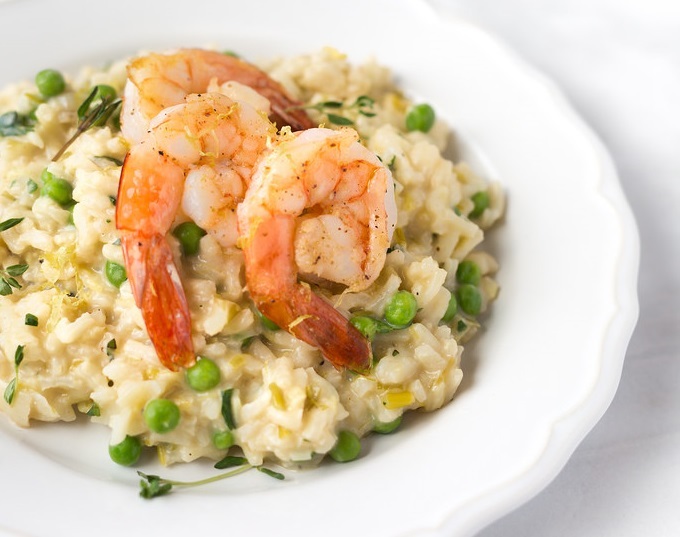 To serve, spoon risotto onto warmed dishes and top with 3-4 shrimp per serving. Garnish with additional lemon zest and chopped herbs, if desired.